I admit it. I have a love-hate relationship with YouTube. It’s great that anyone can create, post, and share videos online. There are some really creative people who use YouTube to highlight their talent and share it with the world. That’s awesome. On the other hand, as a parent, I don’t understand how my daughter can stare at YouTube for hours on end, becoming a veritable YouTube zombie. That’s not to mention all of the inappropriate, unfiltered content that I know she is exposed to on a regular basis. Parents everywhere are wondering what to do about YouTube. It’s here to stay, it’s easy to access, and it’s on almost every device available to kids and adults. As far as I’m concerned, we have to accept it as a fact of life and teach our kids how to use it appropriately. Of course, there are many aspects to consider when dealing with YouTube, like boundaries and discernment for the whole family. My husband and I are, like many parents these days, trying our best to muddle through it all. If you are looking for some basic safety guidelines, check out 5 Ways to Make YouTube Safer for Your Kids by Common Sense Media. Like the title says, it will make YouTube safer, but it won’t necessarily make it safe. The tips in the article are a place to start. I have found that there is so much more to it. But like many parents, I made a few mistakes before I started to get the hang of it. My first tactic, after embracing the fact that I couldn’t keep my daughter away from YouTube, was to become my own version of the YouTube police… It was a horrible idea. It only fueled my paranoia, and the whole thing was exhausting. Plus, it seemed sneaky and wrong. It was ridiculous, and I knew it. So I did something crazy. I sat down next to her and asked her what she was watching… To my surprise, she didn’t want to just tell me. She wanted me to stay and watch with her! So my #1 tip for breaking down the YouTube barrier: Ask your child to share his or her favorite shows with you. Watch Together! I have to admit, there are videos and channels that I really like (to my amazement) and some I am not as excited about. Either way, I am learning a lot about my daughter – and YouTube time is great family time. I realize not all kids – especially older kids and teenagers – are going to be so forthcoming about what they’re watching on YouTube. And I know my daughter probably doesn’t share every video she sees. But what I do know, is that the dialogue and family time that happens as a result of me taking an interest in her, on her terms, with an open mind, is invaluable. I am learning much from our time together, and I hope my daughter is learning from me, too. There are many great family-friendly shows available out there. Kids are very aware of the inappropriate content, and in many cases feel uncomfortable or threatened by it. They need our help navigating it but are often embarrassed to talk about it with adults. How to decide if a Channel or video is okay to watch. What to do if she finds herself watching an inappropriate video. What to do if friends are watching or sharing inappropriate videos or channels. I encourage you to join in with your kids when they are glued to the Tube. Ask a few questions, watch some channels or episodes together and make YouTube a family event. It’s a great way to open up those lines of communication when it comes to social media, boundaries, and discernment. What do you think? Is this something that would work in your family? 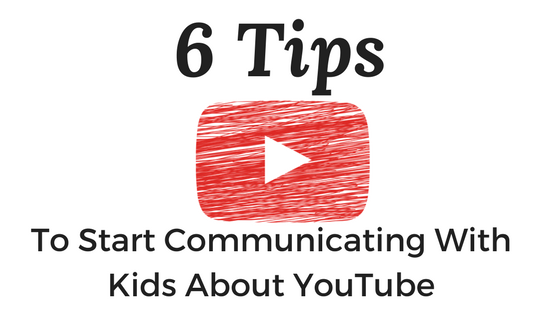 What are some other ways that might work to communicate with your kids about YouTube and other social media?